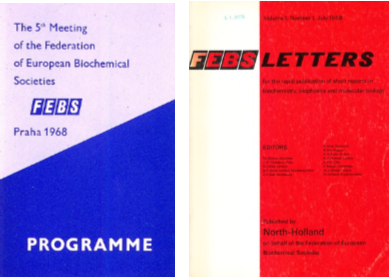 Little did I know in 1968 as a PhD student helping preparations for the 5th FEBS Meeting in Prague, that 50 years later I would find myself in the role of FEBS Secretary General looking forward to the 43rd FEBS Congress in the same city! Here's a look back to the earlier meeting and life as a young scientist at that time behind the iron curtain. In 1965, one year after FEBS was founded, I began my PhD studies. This was the time when the intransigent communist regime in Czechoslovakia slowly began to ease up on its control. For me, politics had little interest then. 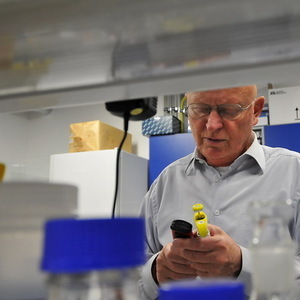 Fortunately, I was able to work in the laboratory of Jiří Doskočil, an outstanding Czech scientist and one of the founding personalities of molecular biology in Czechoslovakia. His laboratory was located in the Institute of Organic Chemistry and Biochemistry of the then Czechoslovak Academy of Sciences in Prague. This was a first-rate institute and was the equal of the best in Europe. František Šorm, the director, was an excellent chemist and science manager – but a person answerable to the Communist Party. This was ‘normal’ for that time. In 1968 my PhD thesis was almost completed. This was a year of political upheaval all over Europe. There were student protests and occupations in Paris, and in Czechoslovakia the legendary ‘Prague Spring’. This was politically a period of hopeful but cautious relief. For researchers like me it meant for example that, at last, issues of the journal Nature with uncomfortable editorials were no longer confiscated. We were exuberant as it became possible for us to communicate more freely with colleagues abroad. Shortly – we started to live a normal life. This was also the year when our Institute made arrangements for the 5th FEBS Meeting to be held in Prague. As a PhD student, my assignment was to help where needed. This included preparing an index for the book of abstracts, and directing participants to buses and cars at Prague Airport. It was an eye-opening experience for me, being the first FEBS Meeting and the first international meeting I was able to attend. It was incredible for me to see world-renowned leaders of contemporary biochemistry and to exchange lab experiences with participants. Many years later, several participants from abroad commented on how well this congress had been organized. This Meeting was where I gave my first talk in English. I remember how nervous I was but I soon discovered that scientists are amiable persons who empathize with the efforts of a young, fledgling scientist. This was the meeting where the new journal of FEBS, FEBS Letters, was launched. My paper was published in the first issue and I felt very proud. With so many new scientific encounters, my life was developing agreeably in bright colours. Following the FEBS meeting, I worked hard to conclude my experiments and write my thesis. Newspapers freely published descriptions of the ruthless 1950s when innocent people were jailed and even executed simply because they did not agree with the communist regime. While following the political development in the country, my main focus was my scientific work. On the night of August 20, 1968, at around 11 o'clock, I was awakened by an unrelenting strange loud noise overhead. Our one-year old son woke up and started to cry. Magda, my wife said, 'It sounds like an airlift'. A good joke, we thought – but it was anything but a joke; it really was an airlift. By morning our country had been occupied by Soviet-led armies of the Warsaw Pact. That sad day the short-lived Prague Spring came to a brutal end as tanks and other military equipment rolled noisily into the city. The bright colour of my life changed to deep black.